It might be the elementary teacher (or child) in me but I have always loved picture books. Even as an adult, when I read an outstanding picture book I smile with sheer delight. They make me happy. I especially love sharing picture books that inspire creativity, taking risks and being brave—all of which tie directly to design thinking. I was delighted this week to receive Kobi Yamada’s newest book in the mail, “What Do You Do With a Chance?” Reading this book prompted me to pull out some other favorites, including Yamada’s two previous picture books. 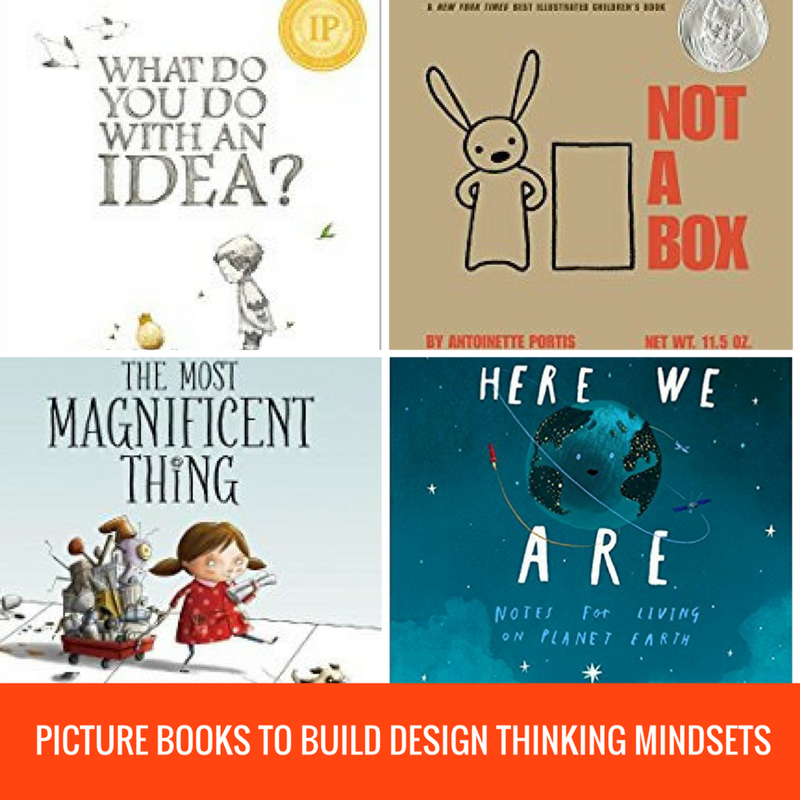 Below are my (current) favorite pictures books that inspire creativity and can be used to build design thinking mindsets with both students and adults. What Do You Do With an Idea? by Kobi Yamada This is the story of how one idea gets brought to life by a child. The idea lingers, but when the child’s confidence grows so does the idea. This book inspires you to nurture ideas, let them grow and then unleash them. What Do You Do With a Problem? by Kobi Yamada In this book, you are faced with a problem but encouraged to look beyond the constraints of the problem and actually see that every problem has opportunities embedded. The longer the problem is ignored, the bigger it gets, but once faced it turns out to be something quite different than expected. What Do You Do With a Chance? by Kobi Yamada In this newest book, a child encounters a chance but isn’t sure what to do with it. After ignoring chances, they stop coming around full stop. This book encourages you to say yes to new experiences, take chance and be brave. The Most Magnificent Thing by Ashley Spires Every creator or inventor knows how beautiful but messy the process of creating can be. We may have a beautiful idea but things don’t always go as planned, we mess up and things don’t work out. The Most Magnificent Thing illustrates both the beauty and the frustration in the process and reminds us all that sometimes we need to step back and relax to get a new perspective. Beautiful Oops by Barney Saltzberg This simple, colorful, pop-out board book helps you celebrate mistakes and turn them into something beautiful. This book has a beautiful playful spirit that will have to you turning coffee stains into art doodles in no time. Not a Box by Antoinette Portis Have you ever seen how excited children are when given large cardboard boxes? If not, you are missing out. Boxes become rocket ships, NASA stations, and forts with a little tape and a few sharpies. This book reminds us that a cardboard cube is anything but a box. The Book of Mistakes by Corinna Luyken With very few words, this book illustrates in a playful way how mistakes can be turned into something new and beautiful. It is always a great reminder that most everything is a work in progress, including ourselves. After the Fall (How Humpty Dumpty Got Back Up Again) by Dan Santat We all know the story of Humpty Dumpty, but have you ever wondered why Humpty was sitting on that wall and what happens to him after the fall? This fun book explores what it means to face our fears and press on despite setbacks. Here We Are: Notes for Living on Planet Earth by Oliver Jeffers The author shares a very personal look at his own hopes and dreams for his child’s life here on earth. Humorous and beautiful, it is a great reminder that we are all in this together and will appeal to the do-gooder in you. Going Places by Peter Reynolds A school go-cart contest inspires children to build the latest go-cart, but who says you have to follow the directions out of the box? Maya doesn’t. She builds a go-cart that is very different from the rest of the students and crosses the finish line in her own way. This book celebrates thinking outside the box, the creative spirit and going against the grain. If you think picture books are just for children, picking up anyone of the books listed above is guaranteed to change your mind. We are all in need of a little beauty, inspiration and fun, sometimes a picture book is the perfect way to deliver that. I’d love to hear if you have a favorite picture book that inspires and nurtures your creative spirit. Your recommendation just might make me update my own top ten list.